The Grooved Brain Coral is a stony coral that has very distinct valleys and grooves that contain polyps as well as ridges that are wider than the valleys. When inhabiting shallow waters, the Grooved Brain Coral tends to grow to longer lengths. Coloration can vary from tans to yellows to grays. The development of the Grooved Brain Coral is executed in a broadcaster mode and individuals are hermaphroditic. The coral is fertilized internally and eggs are released into the ocean. The eggs hatch into swimming planktonic larvae and settle on suitable substrate, where asexual reproduction begins. 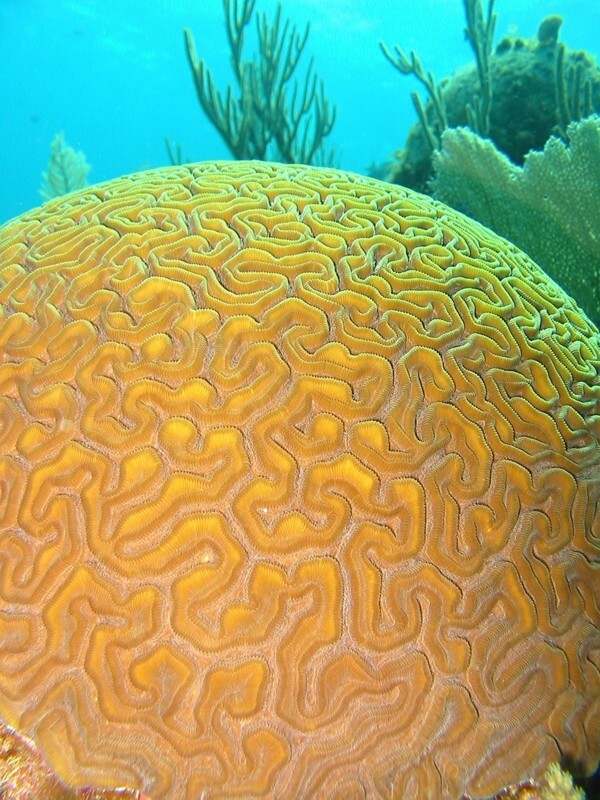 The Brain Coral will remain sessile for the rest of its life. Feeding is accomplished by extending its tentacles at night to filter out planktonic organisms or other small marine invertebrates. The Grooved Brain Coral grows in the Caribbean, Bahamas, southern Florida, and Bermuda. They prefer to grow on semi-lose substrates on the ocean floor about 50m below the oceans surface. Stony Brain Coral require warm water temperatures and plenty of sunlight for their symbiotic algae. Grooved Brain Coral can function as shelter for a large variety of fish species, keeping the habitat in balance. Brain Corals are also a popular diving attraction. Johnson, Brooke. "Diploria labyrinthiformis". Animal Diversity Web. Retrieved from: http://animaldiversity.ummz.umich.edu/accounts/Diploria_labyrinthiformis/.